Vape pen and electronic cigarette (E-cigarette) explosions are growing at an alarming rate. There are millions of e-cigarette users in the United States, and many of them are teenagers and young adults. Quality control standards are low, and the industry is poorly and ineffectively regulated. Unfortunately, this spells a recipe for disaster and unsuspecting vapers are becoming victims of e-cigarettes or vape pens that exploded in their hands or pockets. If you have been injured by an exploding vape pen or e-cig, contact a personal injury lawyer at our firm today. We are experienced attorneys who know how to prove and win your case and obtain appropriate compensation for your injuries. In order to prove your vaporizer pen (vape pen) or electronic cigarette case, your lawyer will first need to establish that the incident was not the result of user error. For example, if you used the wrong batteries with your device, then the explosion may have been caused by your improper use of the unit and not because of any type of defective. Therefore, the first thing your Vape Pen lawyer will need to do is review the instructions and manual that came with your unit to confirm you were using it correctly as it was intended to be used. The next thing your lawyer will do is send the device to a specialized laboratory to be examined by engineers who will determine whether the unit exploded as a result of a poorly faulty device or faulty batteries. An e-cigarette is generally composed of a liquid-filled tank or cartridge, an atomizer that converts liquid to vapor for inhaling, a set of rechargeable batteries for power, and a box mod or housing for the batteries. There are mechanical and electronic vape pens. The mechanical versions are for more advanced users and the user must control the temperature manually. If a mechanical box mod overheats, it is usually the result of user error. An electronic vape box is a bit more expensive and is designed to prevent it from exploding by automatically shutting off the heating element and power supply from the batteries before the temperature rises to a dangerous level. Unfortunately, the shut off safety mechanisms do not always work the way it is intended, largely because quality control with e-cigarettes is poor. The electronic shut off mechanism fails and the unit and batteries overheat until an explosion occurs. In such a case, your e-cigarette attorney will prove that the unit exploded because of a manufacture or design flaw. In some cases, your vape pen is working correctly. The shut off mechanism on the device works, and the heating element is maintained at a safe temperature level. However, there is a problem with the batteries. As a result of the flaw in the batteries, they discharge inside the unit. Only a trained engineer with experience inspecting and analyzing vape pens and e-cigarettes will be able to determination and express a legal opinion as to what caused the incident. Injuries usually involve burns to the leg or facial area. If the unit discharges while inside your pocket, then you will typically suffer from severe burns to your leg and the surrounding area. If the burn is severe, you may suffer third-degree burns and require skin grafting. If the unit discharges while you are in the process of vaping, then severe facial injuries and burns are likely to occur. You may require extensive reconstructive surgery and be left with permanent, life-altering injuries. You should immediately find and keep the receipt for your purchase so that your e-cigarette attorney can establish where your purchase was made. If you have lost your receipt, your vape pen lawyer can still bring a case against the manufacturer. But in order to bring a claim against the wholesaler and distributor who are local and carry product liability insurance you will need to prove who distributed the product, and gathering that evidence begins with the retailer where your purchase was made. Under the rule of strict product liability, all parties in the chain of distribution may be held jointly liable, including the manufacturer, distributor, wholesaler, and retailer. Your attorney will bring a case against one or all of these parties, and they will jointly be responsible for compensating you for your injuries. Most retailers carry only general liability insurance, which does not cover injuries caused by defective products. Only product liability insurance covers such claims. The distributor, wholesaler, and manufacturer will typically carry Product Liability Insurance, which will cover your claims. Call Injury Law Group today and speak to an experienced vape pen injury lawyer. 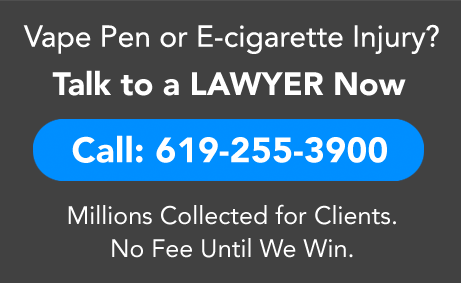 We are experienced personal injury attorneys who know how to win your e-cigarette or vape pen case. Our firm will successfully recover just financial compensation for you.